Seattle’s leader in LASIK eye surgery. For over 20 years, Dr. Stephen G. Phillips and his staff have been performing refractive surgery in Seattle. We meet the highest standard of patient care thanks to our years of experience, our trusted technology and our careful, patient-centric approach. If you are considering refractive surgery, (PRK or LASIK), or another type of eye surgery, please take the time to explore our site and learn more. Or, you can call Sound Eye and Laser (SEAL) to schedule an appointment or consultation: 206-622-2020. We look forward to working with you to achieve your health and vision goals. Dr. Stephen Phillips has been providing refractive surgery in Seattle for over 20 years. 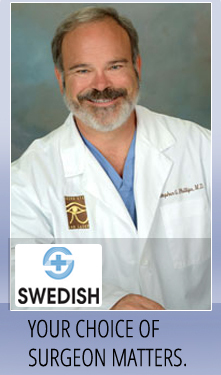 He is an active member of the Swedish Medical Center staff.